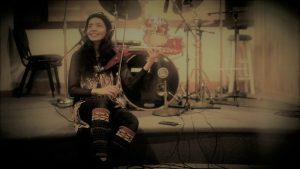 RADHIKA IYER is a California based author, violinist, songwriter, session musician and record producer. She writes and produces music released as solo productions under her name and also records for other producers. Radhika is a proponent of both Indian classical and Western contemporary styles. With an established Indian classical music background, her solo productions exude an extraordinary reification of new aesthetic standards in contemporary music. Elegantly combining eclectic Indian scales and articulations in her compositions, her style embodies a very progressive and novel sounding musical landscape. Radhika is an exemplary when it comes to the aspiring young musicians of today who juggle with the challenges of pursuing an academic career and music. Radhika holds an MBA in Business Strategy, is a Certified Public Accountant, shoulders a full time job in an MNC and yet, finds time to vigorously pursue her passion for music. Radhika plays an unconventional custom made instrument – A 7-string electric violin, tuned to Western standard tuning. The instrument gives her enormous ability to pull off a Metal riff on it, or a beautiful Bach prelude or the impregnable gamakas unique to Indian classical music. A book that helps Western musicians delve into the mechanics of Indian music within the realm of Western Theory and notation. Beautifully composed etudes for piano and classical guitar that would remind you of Bach, but within a whole new sound spectrum of scales from the Indian Melodic System of music. If you are an avid sheet music reader, these seemingly simple, short 2-page compositions will take your reading and musical awareness to a whole new level.